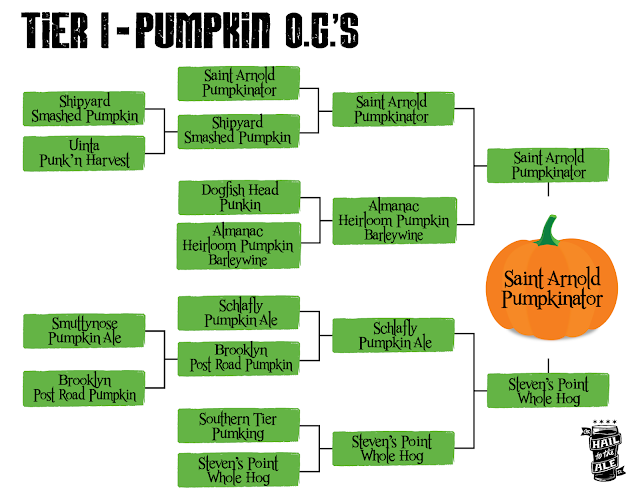 It's All Hallow's Eve and the time has come to unveil the winner of The Great Pumpkin Beer Challenge. We have tasted through 24 pumpkin beers over the last three weeks, tracked down and traded from across the country. It was an interesting challenge to say the least - exploring a category defined by ingredient versus style. We found many very well made pumpkin beers, our preferences came down to the most balanced, drinkable choice. What we loved about this beer: In short, everything. It was by far the most delicious pumpkin beer to touch our lips. Notes of cinnamon, chocolate and roastiness were prominent in the aroma. The full bodied stout, when served at the right temperature was smooth, hiding the alcohol well. This beer finishes dry with just the right balance of spice on the end. Our Tier 3 winner, Steven's Point Whole Hog Pumpkin Ale made it all the way to the finals rising above some steep competition. As far as ales go, this was our favorite, remaining the most balanced and enjoyable for the style. We highly recommend picking some up while it lasts at Bottles & Cans.